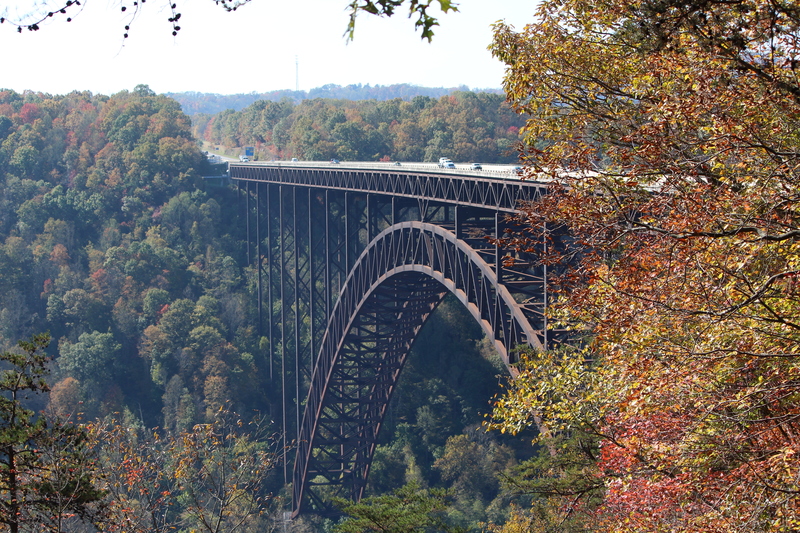 West Virginia gold: Fall at New River Gorge Bridge | Oh, the Places We See . . .
Lovely fall foliage enhances the beauty of New River. 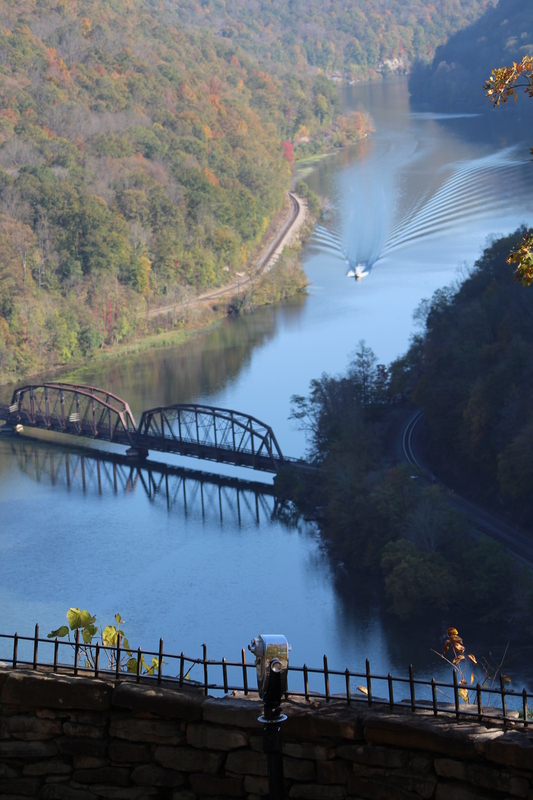 The second leg of our Fall 2015 search for gold meant leaving the beauty of West Virginia’s Pipestem Resort State Park for one of the state’s proudest prouds: New River Gorge Bridge. But getting there was a treat in itself. As you know from some of our other posts, we brake for scenery — some planned, some random with a screeching, “pull-over-here” shout-out from one of us to the other. 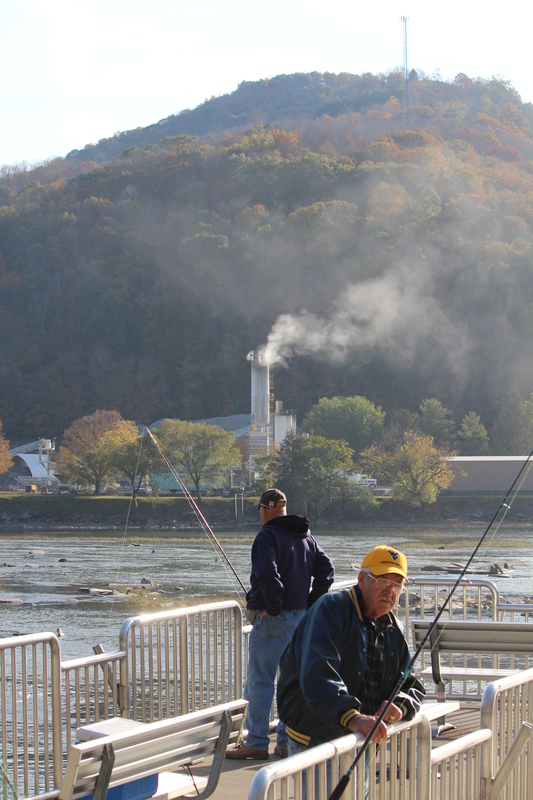 Like the stop at Bluestone Dam where we chatted with fishermen dropping lines into rushing waters. Catching anything? I asked. Whatever’ll bite, one guy said, grinning. Catching anything? I asked. Whatever’ll bite, one guy said, grinning. 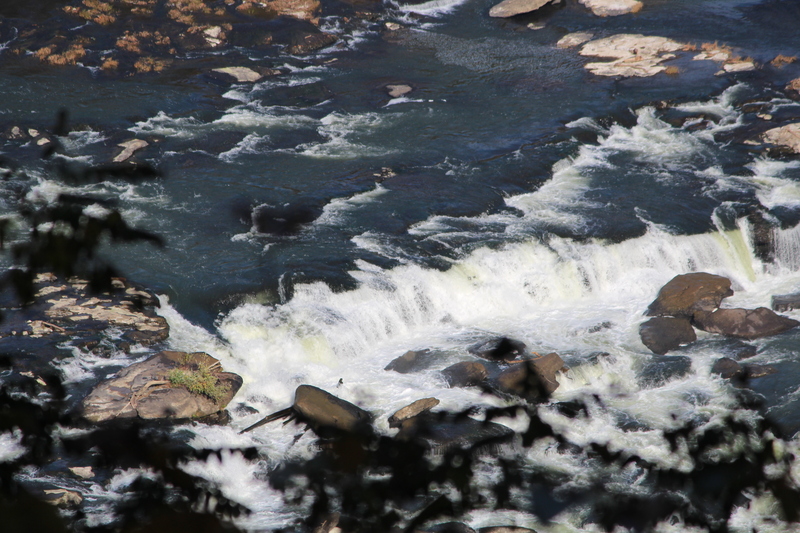 We most always stop where lookouts are set up by the park service — like the overlook to Sandstone Falls. We stop. Get out. Read markers. Take pictures. But here, we lingered. It was the sound of rushing water and the frame of fall colors — a welcome delay. Next stop — our destination: New River Gorge National River. And after roaming through the National Park Service Visitor Center (highly recommend!) to take a look at the map and watch the video, we braved the wooden walkways and stairs (lots of stairs) with glimpses of the river on several levels. 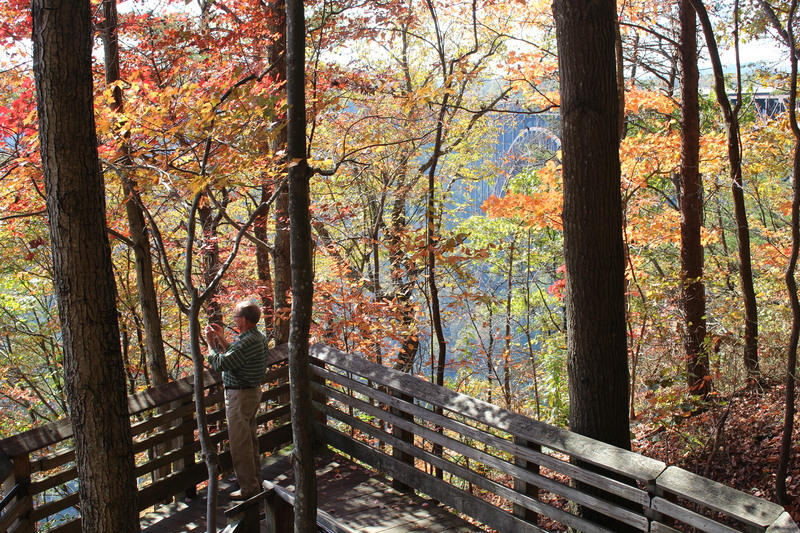 Taking memorable pictures is easy at New River Gorge Bridge where there’s beauty at every turn. And then the view opened up to what we came to see: New River Gorge Bridge. One of the longest (3030 feet) single-arch steel span bridges in the world, the New River Gorge Bridge rises 876 feet above New River — a structure that’s massive, elegant, and truly iconic. As we journeyed toward Beckley, another find presented itself: Hawks Nest State Park from a beautiful stone overlook. As if one serendipitous find weren’t enough, a small sign on a random rural road in Greenbrier County directed us to the charming Herns Mill Bridge. Adventures have a way of finding us when we 1) get off the beaten path and 2) keep our eyes open. And, oh yes, it helps that we have good brakes! Hope you’ll continue our Fall Tour 2015. Next up: Colors of The Greenbrier. 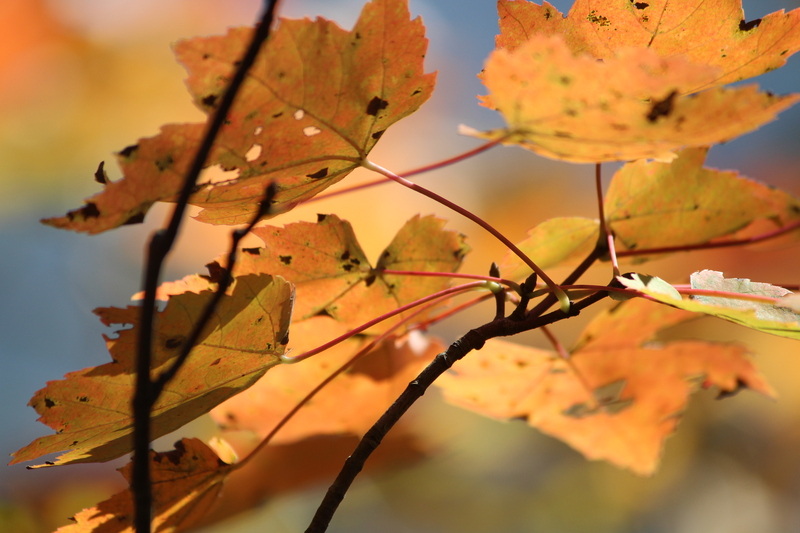 And if want to see fall color next year, remember this state: West Virginia! This entry was posted in Travel, West Virginia and tagged Bluestone Dam, Hawks Nest State Park, Herns Mill Bridge, New River Gorge Bridge, Sandstone Falls, West Virginia. Bookmark the permalink. I love those beautiful autumn colours. So glad you are back in a four-season area — fall is one of our favorite times of the year! We had hoped to get to New England for the first time during autumn, but a wedding in Texas nixed those plans. WV was a great second choice — no prettier state when leaves turn golden. And that little bridge was definitely a find. 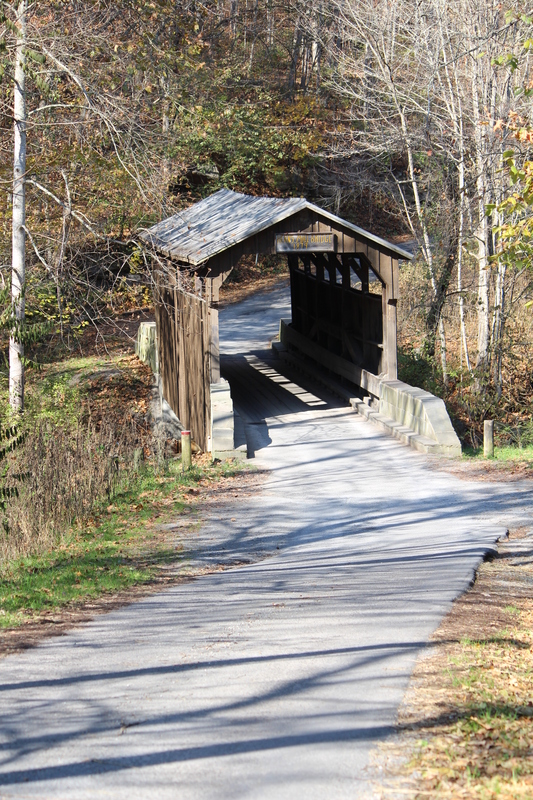 Bert and I have one thing in common, especially now that we have a GPS to get us back on track: we love to get off the main roads to see little markers like the one directing us to this lovely covered bridge. It’s travel as we know and love it — finding the unusual, the overlooked, and the terrific in small places! It’s an absolutely lovely part of the state, and I hope you get there in any season. I can only imagine what Bridge Day would be like, but if I were more adventurous, I’d be there to bungee jump, parachute, or whatever! Best wishes for a great fall! Thanks for sharing……gorgeous pictures and sights! I love fall and all its colors. Will have to remember West Virginia when we consider a road trip sometime in the fall! We think you’d love this state — especially if you enjoy driving through forests or on highways bound by colorful trees. It’s really one of the prettiest states in the fall. Thanks for taking a look! There’s just something about bridges, physically and metaphorically. I loved the ones we saw on this trip from the highly engineered structure of the New River Gorge Bridge to the tiny covered bridges that are still standing. As always, we appreciate your taking the time to journey with us and leave comments. 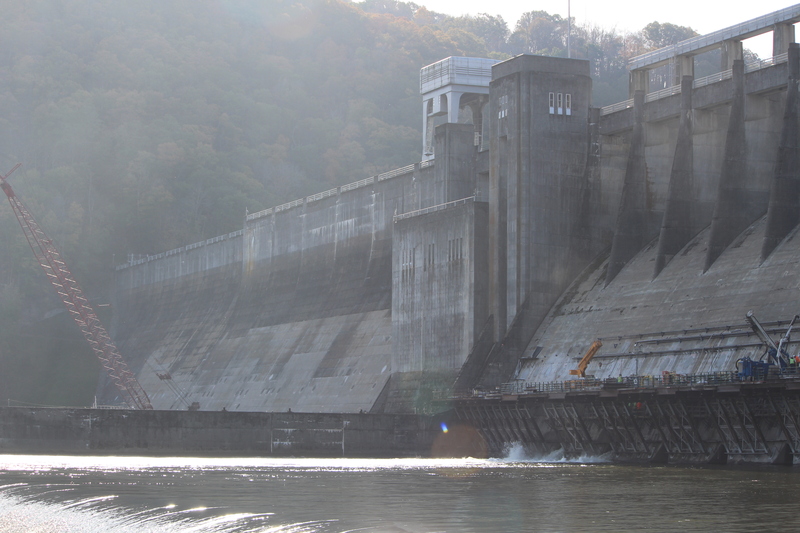 Jodi, thanks for taking the time to check out our blog and enjoy the scenery in West Virginia. Hope your fall is going great — from what you’re cooking to whatever you are doing. It’s great to hear from people all over! Appreciate your taking a look. This is pretty country, for sure. That pretty country is still on my bucket list for bicycling, among others. Beautiful photos Rusha! Thank you for sharing. West Virginia in the fall is now on my bucket list. Thanks, Jeanne. 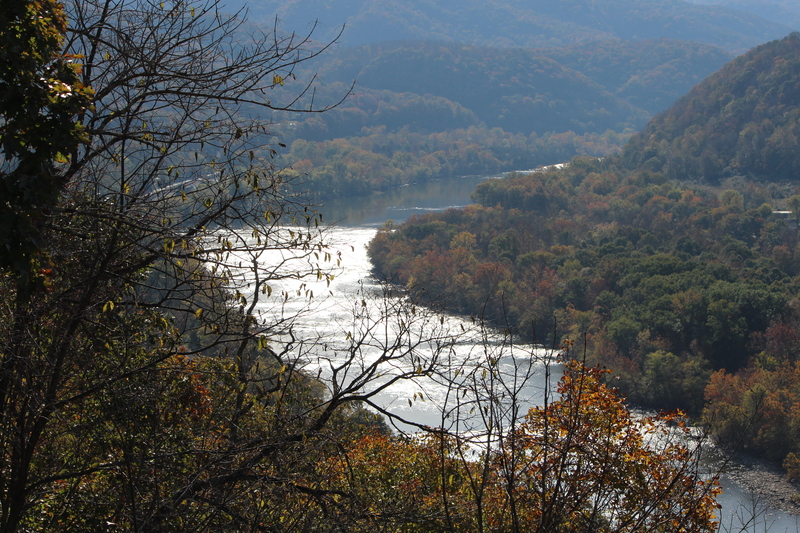 There’s a lot to see and do in W. Virginia — and it’s fairly close to us! Beautiful bridges. Getting off the beaten path often leads to wonderful surprises. You’re so right. We love having a GPS now, too. If we stray too far, “that lady” helps us get back to where we need to be! The best part of any road trip is straying from the ‘agenda’ and seeing what’s out there. Lucky us that you did that! It’s nice to travel without an agenda, too. Many times we are focused on “getting there.” But in retirement, we can meander. Thanks for taking a look! Thanks so much for the comment. I had fun snapping these pics. But what’s not to like about lovely fall color?